Objective: The objective of the study was to conduct a review of the existing literature on homoeopathic research conducted on Vitiligo. Materials and Methods: A comprehensive online and manual search of research studies on vitiligo through Homoeopathy was conducted to identify publications in international search databases and library of Central Council for Research in Homoeopathy published during the period from 2006 to 2016. Relevant research was categorised by study type and appraised according to study design with their clinical outcomes. 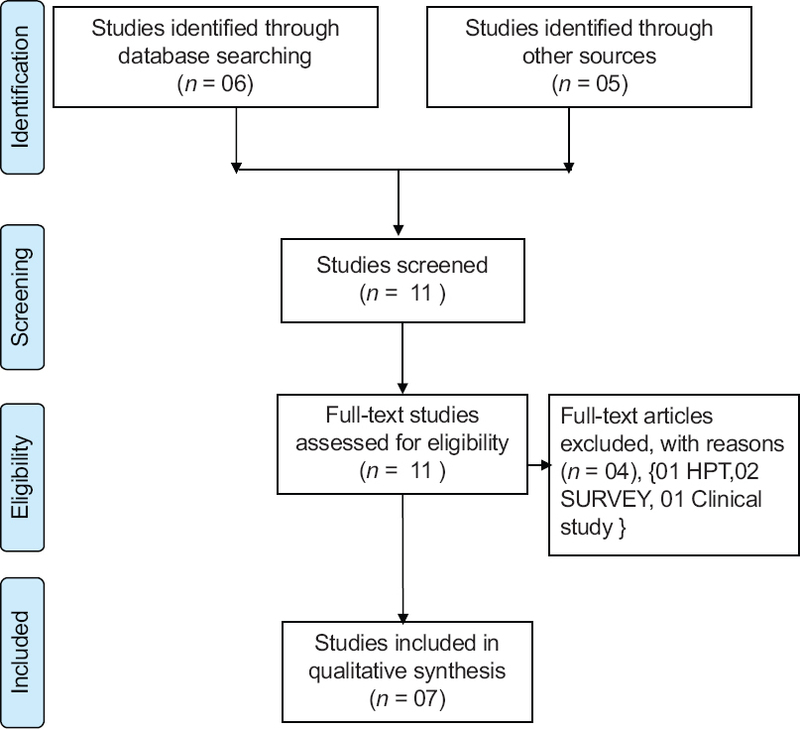 Results: In this review, 11 articles related to Homoeopathy on vitiligo were identified, of which four clinical observational studies and three case reports were assessed. Conclusion: Studies identify a positive role of Homoeopathy in vitiligo were repigmentation has been reported. The treatment, however, is prolonged and needs to be based on homoeopathic principles of totality and individualized treatment. Further, a larger number of studies on convincing evidence-based parameters including validated scales are essential requirements to document the usefulness of Homoeopathy in vitiligo. Objective: The aim of this study is to evaluate the antifungal activity of different homoeopathic mother tinctures against the growth of Candida albicans. Materials and Methods: Homoeopathic mother tinctures (ф) Syzygium jambolanum, Ficus religiosa, Ocimum sanctum, Allium cepa, Thuja occidentalis, Holarrhena antidysenterica and Eucalyptus globulus were evaluated for their antifungal activity against the growth of human pathogenic fungi C. albicans using paper disc agar diffusion method as per guidelines of clinical and laboratory standard (M44-A) with slight modification. The diameters of zone (mm) of inhibition were measured, and the obtained results were compared with that of the vehicle control. Ketoconazole was used as reference standard fungicide. Results: Seven homoeopathic mother tinctures were used in this study and the results indicates that some of the homoeopathic drugs in the study showed significant inhibitory activity against the growth of C. albicans as compared to control. Out of the seven medicines tested, S. jambolanum showed a maximum zone of inhibition as compared to other mother tinctures used. The effectiveness of zone inhibition against the growth of human pathogenic fungi C. albicans are S. jambolanum > T. occidentalis > A. cepa > F. religiosa > E. globulus > O. sanctum > H. antidysenterica. Conclusion: The present study suggests the inhibitory role of homoeopathic medicines against human pathogenic fungi C. albicans. Objective: To study the effect of Anthracinum CH 200 to prevent anthrax in sheep and goats in less and highly endemic villages of Kadapa district, Andhra Pradesh, India was studied. Materials and Methods: This study was conducted in 159,250 sheep and goats, in anthrax-endemic Kadapa district in India, from 2003 to 2008, consecutively covering 1 endemic and 17 less endemic villages. Fifteen millilitres of Anthracinum 200 dilution was mixed thoroughly with 1 L of 2.5% albendazole suspension and drenched orally either with a drenching gun or with a 10-ml syringe, in a single bolus of 10 ml for adults and 5 ml for young ones. Results: All the sheep and goats were protected from Anthrax with a single dose of Anthracinum CH 200 both in non\endemic villages. The ratio of cost of vaccine to cost of Homoeopathic Prophylatic was worked out to be 5.47:1. Conclusions: Homoeopathy is very effective in preventing the anthrax in sheep and goats at a very cheap price and is very safe and has a rapid response. Background: Increased incidence and progression of myopia, especially in Asian countries, have been attributed to excess near work. Topical use of Atropine was effective in controlling myopia but has got side effects and rebound effect after stopping the treatment. Homoeopathy mentions Ruta graveolens (Ruta) for myopia with its action on accommodation. 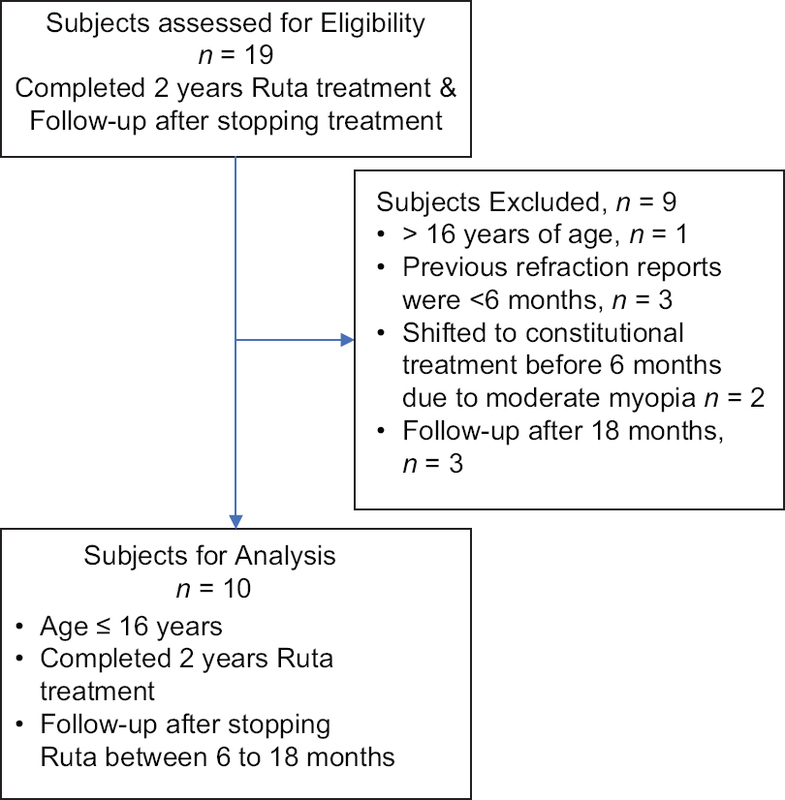 Aim: The aim of the study is to evaluate the effect of Ruta on annual myopia progression rate (AMPR) before, during and after stopping treatment in childhood myopia. Materials and Methods: Ten cases of simple myopia in progressive stage aged 11–16 years were studied retrospectively. Myopia or spherical equivalent of refraction (SER) and AMPR in diopters (D) before treatment were assessed from the previous refraction reports. Ruta 3C was used in BD dose orally for 2 years with a gap of 7 days after every 21 days, and thereafter, treatment was discontinued. Subjective refraction on Snellen's chart at the start, during and after stopping treatment was recorded. From SER values, AMPR at different phases of study was assessed and analysed with paired t-test. Results: Mean AMPR before treatment was −1.10 D (±0.53). After Ruta treatment, there was a significant reduction of −0.27 D (±0.32) in AMPR (t = −4.13, P = 0.003). After stopping the treatment for an average of 10 months, mean AMPR was −0.46 D (±0.49), but this change was insignificant (t = 1.21, P = 0.26). Conclusion: Homoeopathic Ruta 3C was effective in controlling AMPR with no major progression after stopping the treatment. Oral mucositis is a common morbidity induced by radiation therapy and/or chemotherapy for head and neck malignancies. This often results in treatment delays, premature treatment cessation and increased cost. New treatments for oral mucositis are emerging but their success is variable. This is a case report of oral mucositis in Non-Hodgkin's Lymphoma (NHL) reported after 11th fraction of radiotherapy. Chief complaints were ulceration of mouth with painful swallowing. Clinical diagnosis as per the World Health Organization Grading Scale was Grade 3 oral mucositis. Phytolacca 30C was prescribed on the basis of acute totality of symptoms. Ulcers were reduced considerably within 4 days and radiotherapy was restarted and 22 fractions of radiation were completed. This case report suggests that homoeopathic intervention may be the treatment for mucositis in cancer patients undergoing radiation treatment. Background: Some homoeopathic practitioners fear that prognostic factor research (PFR) of homoeopathic symptoms neglects the context of these symptoms. Materials and Methods: The function of repertory and materia medica in the homoeopathic method is discussed. Previous research shows how the repertory can be improved. Outcome and Discussion: The homoeopathic procedure can be divided into two stages: an open mind stage to make an inventory of all possible medicines and a confirmatory stage to select the medicine that fits the totality. Closing the open mind stage too soon will cause confirmation bias. PFR is meant to improve the repertory in several aspects. 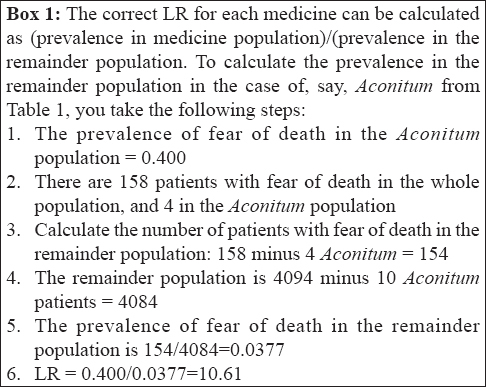 Bayes' theorem provides an algorithm for homoeopathy and the inherent likelihood ratio (LR) a generalisation of Hahnemann's aphorism 153 to a broad differentiation of importance of symptoms arranged by peculiarity and by prevalence in respective medicine populations. 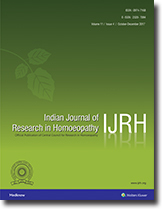 Conclusion: PFR does not alter the way we select homoeopathic medicines, but it improves the repertory. LR generalises Hahnemann's aphorism 153 to an algorithm that distinguishes a large range of symptoms, peculiar and less peculiar, according to their importance for the choice of a medicine.